I read this post by my old colleague Brian, and for once, I am going to come to his defence about it being Marketing's - I even gave it a capital M - fault if customers & prospects are not engaging. Whilst I agree with his statement that it could the design, copywriting etc that could be to blame - the hook, I believe, falls squarely at the blame of Sales not Marketing. Sales need to wake up and smell the coffee, or put it down; You are at the front line, hearing what the customers are saying, what hooks are working and what will get the customer to take more notice than hot Sam. Sales needs to collaborate with Marketing to help them create these hooks in a way that will be engaging, thought provoking and want to find out more - not real on Marketing & Brian to come up with something and then blame them when it doesn't work. 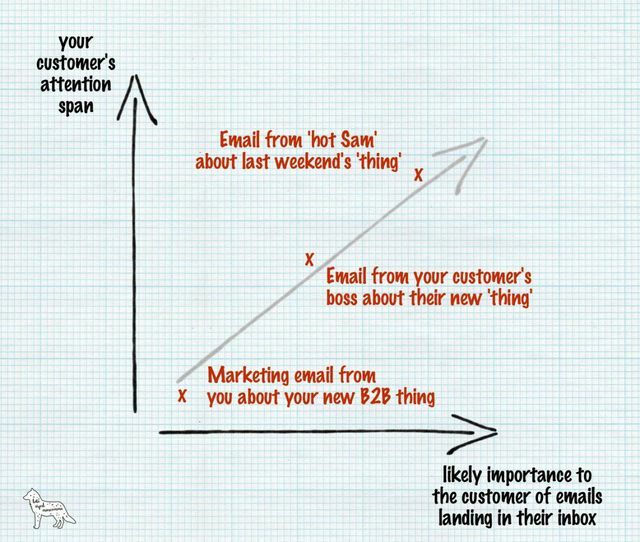 If customers aren’t paying attention to our marketing communications, then it’s our fault as marketers – not the customers’ powers of concentration. It’s our fault that our designs and copywriting and hook didn’t stop them in their tracks. It’s our fault that we didn’t evoke a sense of urgency. Or it’s our fault that we couldn’t relate our products and services to something really important to them.